The portmanteau is one of my favorite forms of humor in everyday life. I combine words constantly around the house. Sometimes the result is humorous; sometimes it only causes my wife to laugh at me. But one portmanteau has found its way into my everyday lexicon and spread to friends and family: productination = productive + procrastination. Never does doing the dishes, filing paperwork, or writing a blog post sound as good as when one has a deadline for an essay, or even better, a stack of papers to grade. In this spirit, we will offer a regular feature of articles and links on humor-related topics to allow you to productinate when you have better things to do. If you have links of articles or sites to look at, please email me at wustert@gmail.com or add a comment to the post. Born July 25, 1923 (d. 2008). While spending a week in a city outside of Detroit helping my wife’s grandma transition from a rehab hospital to home, we rediscovered the comedy gold of The Golden Girls, which was one of my favorite shows as a child and remains incredibly funny. Getty’s character of Sophia Petrillo is a gem. A reminder of how few older women (and men, for that matter) are represented in TV comedy now (apart from Betty White). Sharon McCoy, “Is a Joke Really Like a Frog?” and my piece here. Born July 11, 1899. White is famous for children’s books, style guides, and his work at the New Yorker, but in humor studies, he is probably best known for his introduction to the 1941 book, A Subtreasury of American Humor, which he edited with Katherine White. Analysts have had their go at humor, and I have read some of this interpretative literature, but without being greatly instructed. Humor can be dissected, as a frog can, but the thing dies in the process and the innards are discouraging to any but the pure scientific mind. Practically everyone is a manic-depressive of sorts, with his up moments and his down moments, and your certainly don’t have to be a humorist to taste the sadness of situation and mood. But there is often a rather fine line between laughing and crying, and if a humorous piece of writing brings a person to the point where his emotional responses are untrustworthy and seem likely to break over into the opposite realm, it is because humor, like poetry, has an extra content. It plays close to the big hot fire which is Truth, and sometimes the reader feels the heat. 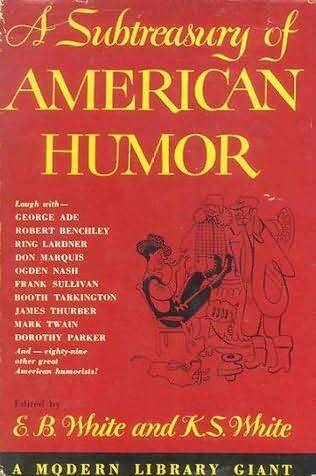 Thus, the humor collection is a “subtreasury,” and thus humor studies confronts some longstanding critical and cultural views about humor as a subject of knowledge. But then again, much can be learned from dissecting a frog, can it not? [William Dean Howells], “The Innocents Abroad,” 24: 146 (December 1869), 764. Kamatschatka (now Kamatchka) is a peninsula in eastern Russia, which had a port prominent in Alaska’s exploration. An excerpt from Frederick Douglass’s 1852 speech, “What to the slave is the 4th of July?” An example of a use of humor (specifically his call to mockery at approximately 3:00) of a great power.